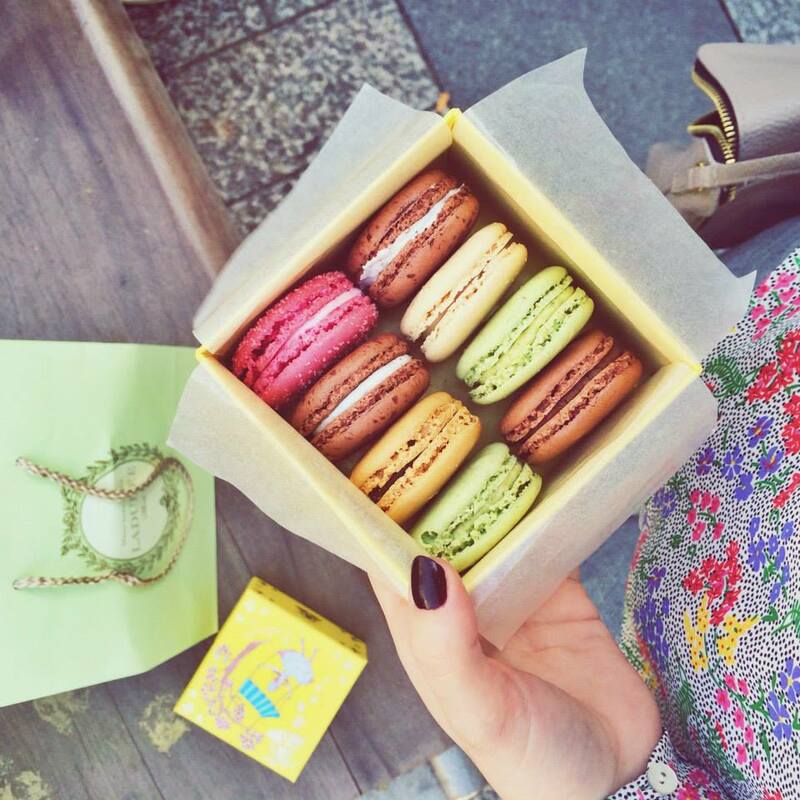 I can still remember my first pistachio macaron from Laduree (a famous and very luxurious french bakery.) I was thirteen years old, excited to be visiting Paris for the first time, and hungry for culture and adventure. I knew French cuisine was suppose to be amazing, but I never expected to love something so much. The macaron was crunchy on the outside, soft on the inside, and had an incredibly pungent pistachio flavor. It has since remained my favorite dessert. I’ve been wanting to bake these puppies for quite some time. But even after much Googleing and YouTubeing, I still didn’t feel comfortable jumping into such an art. But everything changed a couple weeks ago when my friend Jenna surprised me with a macaron baking class at Sur La Table! Best birthday present, ever. After learning all the basics, I decided to trust my gut and finally make PISTACHIO macarons. Below you will find step by step instructions (and images) to help you through the process. Every little element can break or make your macaron, including the weather outside, so make sure to follow the directions carefully. Ever wondered why they’re so expensive? It’s all due to their ingredients, the time it takes to make them and their delicacy. You’ll understand more once you make your own. First things first: Mise en Place (french for “putting everything in place”). Lay out all your ingredients and take out your eggs. Eggs whisk better when they are room temperature and a couple days old. Sift your almond flour, pistachio flour, and powdered sugar a couple times. The finer the flour, the better. This step is VERY important if you are making your own flour. In a separate mixing bowl, beat eggs whites on medium speed using a hand or stand mixer. Slowly add sugar when eggs start to become foamy. Continue to whisk until you see hard peaks. Add the food coloring and mix for another minute. You want to make sure the color is distributed equally, but avoid over-mixing your eggs. With a spatula grab a heap of egg whites and incorporate it into the flour mixture. Slowly fold the mixture. The technique of folding is extremely important as it prevents the egg white mixture from deflating. Run the spatula clockwise around the side of the bowl and then cut the batter in half. Continue adding the egg white mixture and continue this motion until the batter has thinned out. To test your batter, drop a heap of batter into itself and wait ten seconds. If the batter has dissolved within itself, then it’s ready. At this point, it is vital that you stop mixing and stop adding more of the egg white mixture (if you have any left.) Over-mixing your batter will make it too runny! A lot of stores sell baking sheets with circles printed on them. I, on the other hand, just draw my own circles. I’ve found that the top of a pill bottle makes for the best stencil. Don’t forget to flip the parchment paper once you’re done drawing your circles! You don’t want the led from the pencil to touch your food. Pipe out the batter into the circles. Try your best to keep the batter flat when piping. You don’t want your macarons to look like Hershey Kisses. All done. Now it’s time to wait for the shell to harden. It usually takes about 15-30 minutes depending on the humidity. If you’re in a very humid environment, give yourself the full 30 minute or more. 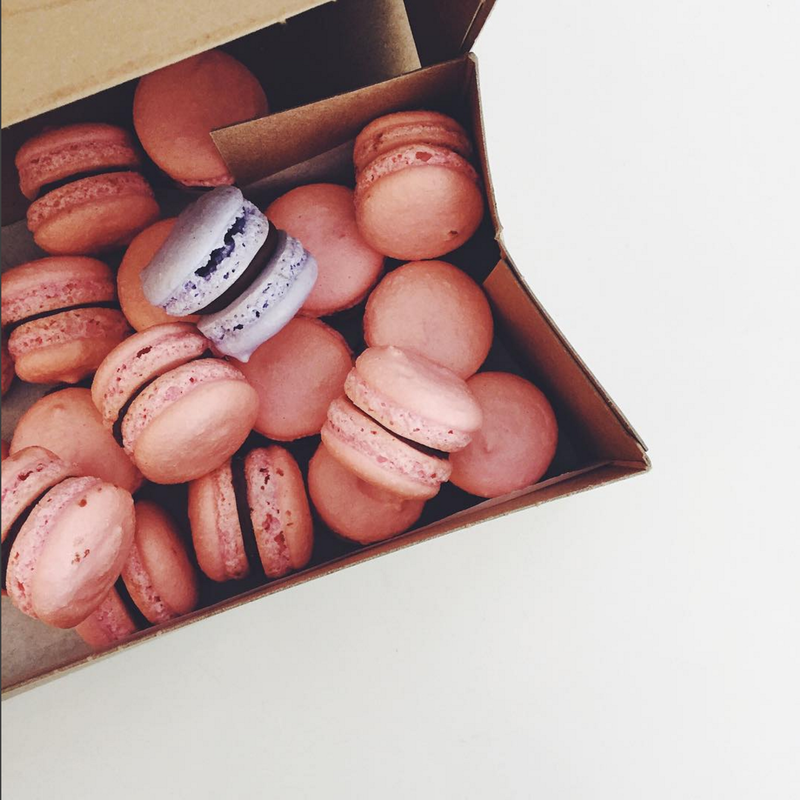 To test if they’re ready, simply tap a macaron lightly. If the mixture sticks to your finger, give it more time. If it’s doesn’t, then into the oven it goes. The macaron shells should be ready between 15-20 minutes. All ovens are different, so make sure you’re watching them! If you think they’re ready to come out of the oven, tap a macaron with your nail or finger. They’re done when they sound hallow. Let them cool a little and begin paring the macaron shells. This will make piping the filling way easier. It will also ensure that all your macarons have an adequate pair. Once they’ve completely cooled, begin piping the filling and sandwiching the two shells. The macarons can be eaten right away, but I suggest your leave them out for 24 hours before devouring them all. The 24 hours will give the filling time to harden and make the inside of the macaron a little softer and mushier. You can also pop them in the freezer to enjoy at a later date! Cut the butter into small pieces and slowly incorporate it into the mixture. Remove the mixture from the hot water bath once the butter has melted. Add pistachio paste and mix. Add confectioner’s sugar. Add less than the full cup if you feel like your filling is thick enough. Feel free to add more if you think it’s too runny. Cover and let sit in the fridge for 45 minutes before using. *Want to save on pistachio flour or can’t find any in stock? Make your own! Thrown in a cup of shelled pistachios into the food processor and begin to pulse. Slowly add granulated sugar once you see the pistachios breaking into very small pieces. There’s really no “right amount” of sugar to add, so you’ll have to eye-ball it. The sugar is just there to prevent the pistachios from clumping together and becoming a pistachio paste. **Put 2 large bunches of shelled pistachios into the food processor and let the machine do it’s job. You might need to stop the machine and scoop out the pistachio paste from the edges a couple times. Add a small splash of vegetable oil if you think it’s not sticking to itself as much.